MARKS AND SPENCER. very soft 100% leather. colour is black. length from collar seam centre back to hemline 63.5cm. fully lined with red acetate and viscose quality lining. front slip pockets. fastens with a zip. Leather Look jacket Size 16 M&S Collection. Ladies Marks & Spencer Limited Collection Jacket Black 100% Leather Lined Biker Style Zip/Button Fastener Front Zip Pockets Size 12 Ladies Marks & Spencer Limited Collection Black 100% Leather Jacket Size 12. Condition is Used. Dispatched with eBay delivery – Shutl 1 day. Marks And Spencers Black Soft Real Leather Jacket Size 16 Ladies . Condition is Used. Dispatched with 2nd class Royal Mail Please note as per photos there’s a few marks I offer combined postage, please email me at the end of the auction before paying so I can adjust the invoice. As I use the app, it doesn’t link a buyer to several items. UK Only All my items are clean, from a pet and smoke free home. Unless stated on listing, there are no buy it now prices....so grab a bargain most starting 99p Please check out my other items I am having a massive clear out! M&S Ladies Zip Front Leather Jacket Size 16. Condition is Used. Brown soft leather. Very good condition, only worn half a dozen times. Marks And Spencer Autograph Weekend Tan Leather Jacket size 14 New. Absolutely gorgeous, butter soft tan leather. Features gentle gathers at waist, very flattering. Button fastening. Thank you for looking. Style: Soft Real Leather Tailored Fitted Jacket With a Mandarin Collar. Excellent Condition. This Elegant Tailored Jacket is made from Beautifully Soft Leather. Colour: Chocolate Brown. Material: 100% Soft Real Leather. M&S Soft Leather Black Biker Jacket Size 16. Condition is Used. Dispatched with Royal Mail 2nd Class. Reversable from Black to Navy Blue.with patch pockets on both. A beautiful luxury leather jacket. sold out within two weeks. 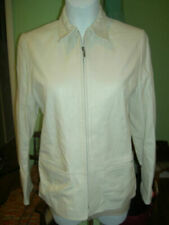 Ladies soft 100% leather jacket hardly worn and in excellent condition. The jacket is a olive green, 4 button fastening, stunning peplum hemline and it is fully lined with viscose quality lining. MARKS AND SPENCER. Collarless Leather lined jacket. Size UK 12. neck to hem 60cm length. Outer sleeve length 64cm. 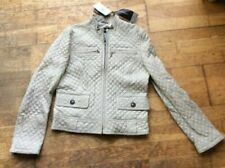 M&S Beige Crop Leather Jacket Sz 10 RRP £150! M&S Beige Crop Leather Jacket with shoulder pads. Sz 10 RRP £150!. Condition is New with tags. M&S BNWOT Womans Black 100% Leather Jacket Size 12 , Fast Post . M&S BNWOT Womans Black 100% Leather Jacket Size 12 , Fast Post Please See Other Items Listed . Lovely Soft Black Leather Jacket by M&S Really nice quality jacket looks lovely on. Size 16 petite Approx measurements- Armpit to cuff - 17 inches (43cm) Collar to bottom of jacket- 27 inches (68cm) Excellent condition From a pet & smoke free home I always obtain proof of postage for items sent. M&S black 100% leather jacket with a two button front fastener, two front pockets, spare button and deep red lining. M&S Black 100% Leather Button Up Jacket Size 20. The jacket is in excellent condition, worn once only. MARKS AND SPENCER - Portfolio. stunning ruched detail to the waist. very soft 100% leather. sleeve from underarm to end of cuff 45.5cm. colour is black. length from collar seam centre back to hemline 59.5cm. 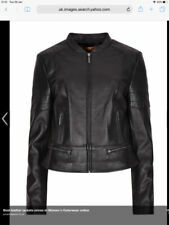 Marks & Spencer Ladies Leather Jacket - 14. With little use and in very good condition - soft leather - Italian made. Two side pockets and zipped front. Colour Camel - looks great with black or navy and is a great summer colour for a leather jacket. Nothing exudes style like a good-quality faux leather jacket. This faux leather ladies’ jacket is the versatile piece your clothing collection is missing. Marks and Spencer Faux Leather Biker Jacket with Faux Fur Removable Collar. marks and spencer Autograph brown leather biker jacket size 10. Excellent. Great for dressing up or casual wear. Condition is Used. Dispatched with eBay delivery – Shutl 1 day. This is high quality soft leather with lots of unique detailing such as raised pads on the shoulders and 4 zip up pockets on the front. Marks & Spencer AUTOGRAPH Taupe Real Leather Bomber-style Jacket - Small Size 12. Condition is Excellent Dispatched with eBay delivery – Shutl 1 day. Size L on label, however was advised that this was ladies size 14 as the leather range had a different sizing. Other than that in a very good preloved condition with plenty of life left! Grab a bargain! Ladies Marks & Spencer Butter soft Brown Leather Trenchcoat with brown suede trim 14. This is a lovely coat jacket In good condition hardly worn - 37" long and 20" across the bust. Condition is Used. Dispatched with Royal Mail 2nd Class. This is a gorgeous off white soft supple leather jacket from the Autograph range at Marks & Spencer (by Anthony Symonds). These are magnified in the photos and are not highly noticeable. This is a quality jacket and has hardly been worn. Made of genuine black Leather, complete with a black lining. A Good Used condition. Pit To Pit- 49cm. “Autograph” by Marks & Spencer. Real Leather Zip Jacket in Black. Size U.K. 12. Black soft leather with woven leather pattern collar and pocket detail. Lovely jacket in excellent condition. SLEEVES 23". ARMPIT to ARMPIT 19". LENGTH 25". PER UNA byMARKS & SPENCER. Ladies fully-lined shorter-length leather jacket with lovely white tailored detailing. 23" shoulder to cuff. Marks & Spencer Black Long Real Leather Coat Size 8. Condition is Used. Dispatched with Royal Mail 2nd Class. Please note item is posted in recycled packaging. M&S Limited Collection Tan Leather Jacket Size 14. Only worn indoors. Very soft leather - the peplum gives a lovely feminine shape. Marks and Spencer Limited Collection Black Fitted Genuine Leather Jacket! Used but in very good condition! BUTTER SOFT LEATHER. M&S REAL LEATHER BLACK COAT. Marks and Spencer real leather long coat size 10, unlined, edge to edge, belt missing, but was only a fine tie and looks better without! marks from being worn as expected with leather. Marks and Spencer brown leather coat. Woman's Size 14. Excellent condition. Only worn a couple of times. 100% Leather. 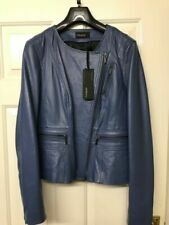 M&S LEATHER Jacket Sz 20. 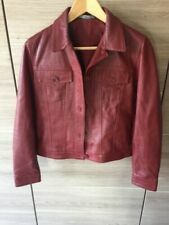 M&S brown LEATHER Jacket Sz 20. Condition is Used. Dispatched with Collect . Thank you for looking.